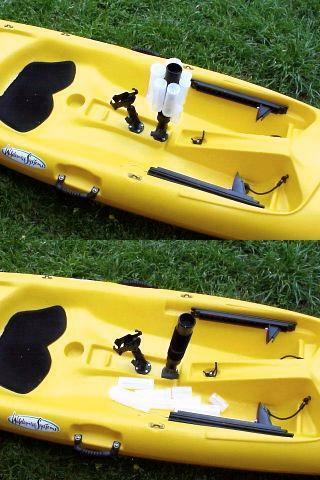 Kayak fishing made easier with TALS Tackle Systems. Storing, accessing and organizing lures when kayak fishing has been no easy feat...until now. Paddling with a PFD and a TALS Chest Pack is not a problem. The pack adjusts to your personal fit (out to a 66" chest) and also converts into a waist pack or satchel, whatever you prefer. The pic above right shows an easy way to store TALS Tubes in a round bucket hatch. 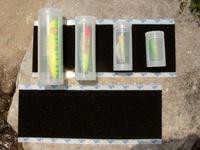 The storage possibilities with the TALS Tubes and a little Velcro is limited only by your imagination. Velcro Loop Strips sold by the foot or yard in 4 inch widths. Items on this page can be purchased below. Velcro Installation: The tubes already have a hook attachment on them so all you need is the loop material above. For optimal adhesive performance follow these tips. Make sure intended surface area is clean and dry. Heat up surface area and Velcro to between 80 and 100 degrees F. A few hours in the hot sun or a few minutes with a hair dryer or a space heater will do. Apply some rubbing alcohol to heated surface and let evaporate (just a little on a clean cloth). Then apply Velcro strip starting at one end applying hard, even pressure working out any air bubbles as you peal the backing off the strip toward the other end. Make sure strip is worked down well and make sure corners and edges are down. Do not touch or use for 24 hours (curing time).